According to Amazon, ebook sales have already surpassed hardback book sales and will surpass paperbacks sometime in 2011, and then both hardback and paperback combined sometime shortly thereafter. That’s a much faster timeline than most of us expected and it speaks to how fast the e-reader market is accelerating. With that in mind, we’d like to help TechRepublic readers in selecting an e-reader, since many of you are using them not just for reading books but business documents as well. Take a look at our photo gallery of the top 10 e-readers. You can also read the list in text format below. The premier e-reading device is the Apple iPad, for two reasons: 1.) Its high-quality full color screen, and 2.) It’s ability to handle everything from ebooks (from multiple ebook stores and in multiple formats), magazines, PDFs, newspapers, web pages, emails, and many other electronic files. It’s the information omnivore’s device. If you just want to read books, there are better options. If you’re only interested in books and newspapers and don’t want the distraction and expense of all that other stuff on the iPad, then the Amazon Kindle is the best choice. The third generation Kindle was just released in August and it is smaller, thinner, and less expensive than ever. And, the Kindle ecosystem is bigger than ever, with Kindle apps on iPhone, iPad, Android, BlackBerry, PCs, and Macs so that you can read and sync your Kindle ebooks across lots of different devices. Brick and mortar bookseller Barnes & Noble has gotten into the e-reader mix with the Nook. You can try one out at a kiosk in one of its book stores. The device itself has a much more clunky experience than the Kindle or the iPad, but it offers the largest ebook library with over a million titles (Amazon offers 700,000). Not to be overlooked as an e-reader is the iPhone. You can read Kindle and Barnes & Noble ebooks on it as well as lots of news sources via apps and web pages. You may not want to sit down and read on it for hours, it’s great for reading when standing in lines, waiting at the doctor’s office, and traveling, for example. You’d be surprised at how much reading you can get done just by using these short snatches of time. 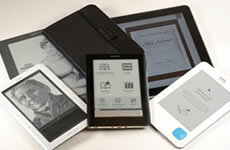 The Kobo is Borders’ answer to its chief rivals Amazon and Barnes & Noble in the e-reader race. It’s a lightweight, low-cost device that does a good job of syncing with a PC and reading ebook files that can be loaded from your PC (including ones from the Borders ebook store) but doesn’t offer wireless book buying like Amazon and Barnes & Nobile. It also doesn’t do highlighting or note-taking. Possibly the most elegant e-reader is the Sony Reader Touch, with its metal exterior, ultra-slim form factor, and integrated touchscreen. Like the Kobo you’ll have to transfer ePub and PDF files to the Sony Reader Touch from a PC. But, the Sony includes annotation ability, even freehand drawing notes on the touchscreen using the included stylus. Amazon’s oversized Kindle, the DX, is made for people who read larger format books or simply want more screen space to read regular books. You’ll pay for that extra space since the Kindle DX is over twice as much as the smaller standard Kindle. This is a niche product aimed primarily at textbooks for students. Just as we talked about the iPhone as an e-reader, we also have to keep in mind that Android phones can be effectively used as e-readers as well. 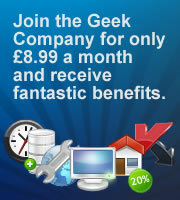 Like the iPhone, the three major ebook stores — Kindle, Nook, and Kobo — all have apps for Android. The best of the Android phones, in my opinion, is the HTC EVO 4G and its large 4.3-inch screen make a great e-reader as well. Other top Android choices for e-reading: Samsung Vibrant and Motorola Droid X. The Alex is an e-reader that runs Android. It looks fairly similar to the B&N Nook (and Spring Design has sued B&N over that) in that it combines an e-ink screen for reading and a touchscreen at the bottom. But, the Alex is a little more sophisticated, not nearly as sluggish as the Nook, and a lot more expensive. It’s an interesting experiment in e-reading nonetheless. Another interesting e-reader that we’re starting to see in a lot more retail stores is the Pandigital Novel. At first glance, it actually bears some resemblance to the iPad — although it has a lot more plastic and the screen size is only 7-inches (vs. 10 inches on the iPad). Like the Alex, it’s based on Android. It’s not nearly as polished of an experience as the iPad, but it’s much cheaper and it’s still an attractive touchscreen e-reader with a lot of future potential.